For some of us, resting seems like a waste of time—it means we're missing out on other things. For others, rest seems like a luxury—there's simply too much to do. And for almost all of us, we crave rest, but don't always know how to. This warm, realistic, humorous book shows us the huge spiritual, emotional and physical rewards of rest. It shows us how rest gives us time to spend with God and remember his grace. Discover how rest fuels our joy and confidence in God's sovereignty as we learn to depend on him, and not our own efforts, and are refreshed by the power of the Holy Spirit. 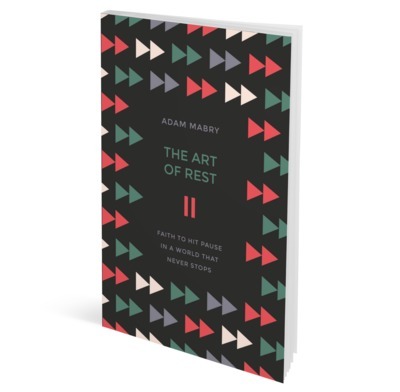 Adam Mabry shows us how rest helps us make space for relationships, shared experiences and moments to remember; how it liberates us from the pressure of self-reliance; how it gives us a chance to think and reflect; and how it stops us from burning out. Finally, this book casts a realistic vision for rest that is less rule and more rhythm—less onerous restriction and more liberating art form. Adam Mabry helps us to learn the 'art of rest' with some practical suggestions. The world never stops. But we need to. And as Christians we can by having faith to hit pause and experience the rich rewards of God-given rest. The modern world's frenetic pace and anxious striving too often pervade our Christian lives and church culture. In answer, Mabry's book is full of honest reflections, theological depth and practical insights. Mabry does far more than provide a list of tips and rules; he reorients our desires according to God's word, teaching us why and how to embrace rest from God's perspective and to delight in Him. The Art of Rest isn’t just about rest; it’s about life—what we are here for. Adam Mabry brings together personal experience, biblical conviction, and keen cultural analysis into a brief and enjoyable book that offers a gospel-centered solution to an ever-present problem. I needed this book. I think you probably do, too. I've read a lot of books on rest for busy Christians, but this is one of the best. It's lively, convicting, and relentlessly focused on Jesus. I loved this book. It is very easy to read and is one of those books that says something important but in a simple way. A book that changed my view on things. I liked the way it was like a play built up to the last chapter. It remains in your mind after you have read it. Great book about a very important topic. In a world where the going always seems to be tough, and the race never ending, this book brought about an 'eye of the storm' type of serenity and encouragement, a reassurance that God created us to endure and outrun the pace of the world, but with HIM and HIS way. A thought provoking, life changing and spiritually inspiring read.